Menu: Antipasti, salad, assorted grilled panini, gourmet pizza, and non-alcoholic beverages, served family style to allow for networking with fellow attendees. Cash bar available – cash only please. 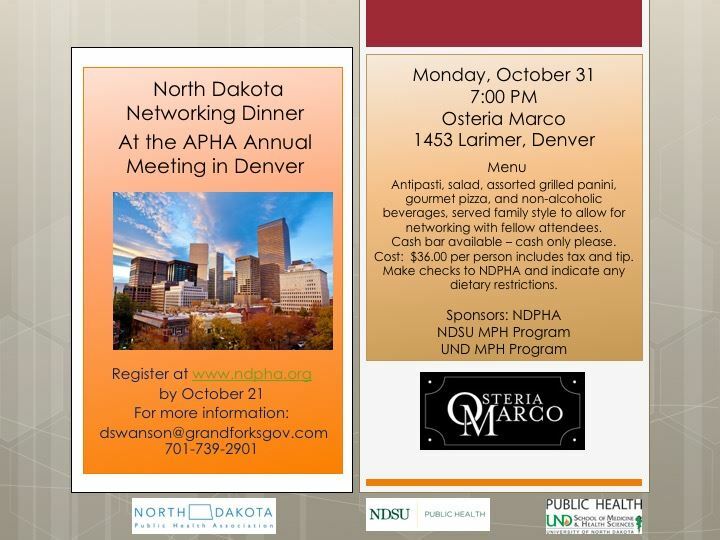 If you are a student of public health at NDSU or UND, your meal has been covered. Antipasti, salad, assorted grilled panini, gourmet pizza, and non-alcoholic beverages, served family style to allow for networking with fellow attendees. We look forward to networking, sharing good food, drinks, and conversation! This dinner is always a highlight of the APHA experience. If you should have any questions please contact Debbie Swanson at dswanson@grandforksgov.com or at 701-739-2901. Registration has been extended until October 31, 2016.